Last weekend may have been the best of my life for one very simple reason: the temperature dropped below 20C. Finally! After months of coming home from work sweaty and uncomfortable, this was all I wanted. When I was complaining about the persistent heat last week, some of my students teased me that I wanted British weather. And in fact, the mild weather is one of the things I miss the most about the UK. Another thing I miss, of course, is pie. When Dr HH and I popped home during the summer, Pie & Ale was high on our priority list of eateries to visit in Manchester. And as usual, it didn’t disappoint. It may not be to every vegan’s taste: not only does it also have meat pies, but it has daily specials that tend to celebrate ‘exotic’ meats. 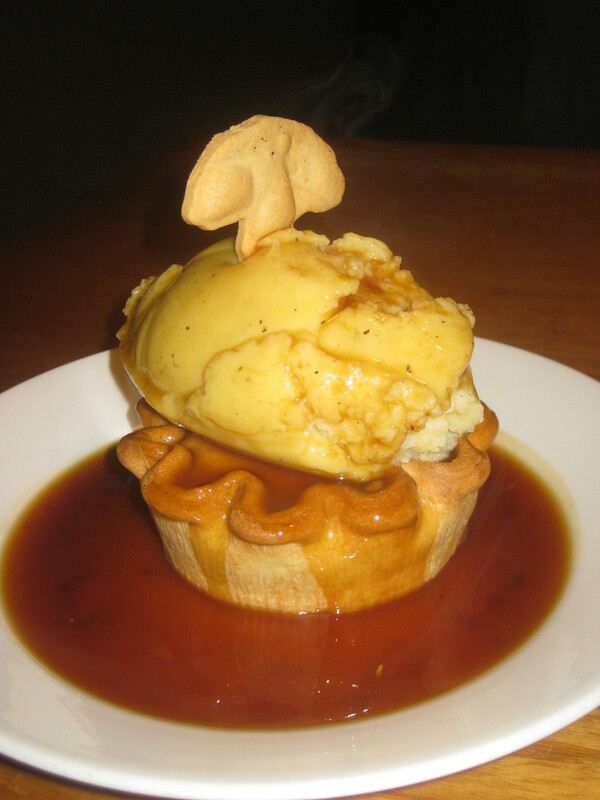 This time, for instance, crocodile pie was on offer. But it does have one vegetarian and three vegan savoury pies, plus one vegan offering for dessert. This is an improvement on when I first visited in 2014 and there was one each of vegetarian and vegan. Back in 2014, this was the only vegan pie. I believe it had a Moroccan flavour, which didn’t sit brilliantly with the very British mash and gravy, but it was tasty enough. And that summer they offered a lighter vegan dishes, though whether something this huge could be considered ‘light’ is debatable. 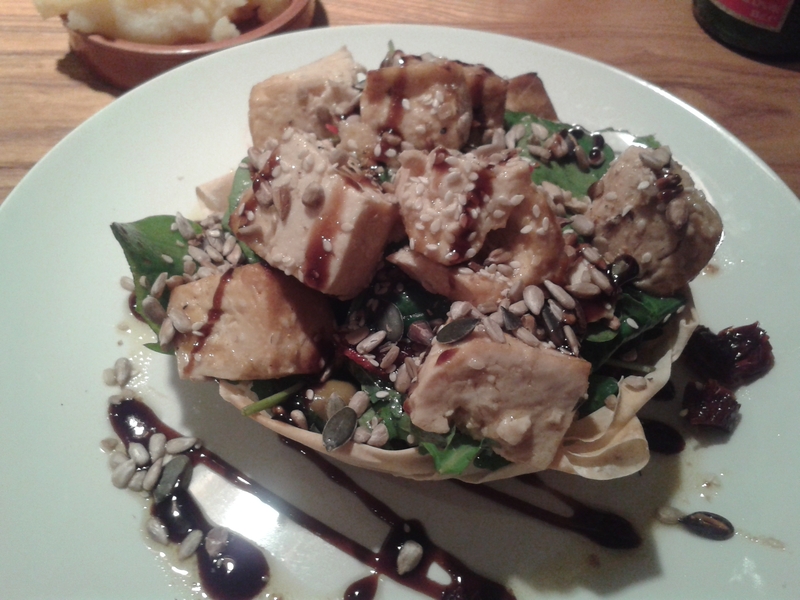 It had filo pastry and nice big chunks of tofu and a scattering of pine nuts. It was delicious, of course. Back to summer 2016, and the three vegan options are: leek and wild mushroom; tarka dahl; and white bean, butternut squash and kale. I went for the mushrooms, but was a little underwhelmed by the filling, which was heavier on leeks than funghi. Still, the pastry is consistently delicious, and there are few things I love more than pastry. Comparing the photos, it looks like the mashed potato portion has increased over the years – I couldn’t even finish it this time! After spending time in Europe, it always disappoints me that there are so few all-vegan establishments in a thriving city like Manchester. But I take heart from the fact that more and more places are adding plant-based options, and, in the case of Pie&Ale, actually developing their menus to be increasingly vegan-friendly. Maybe next time I’m home (huddling up against the cold-but-not-freezing winter – again, much better than the extremes in Prague! ), there’ll be a 50% vegan menu! 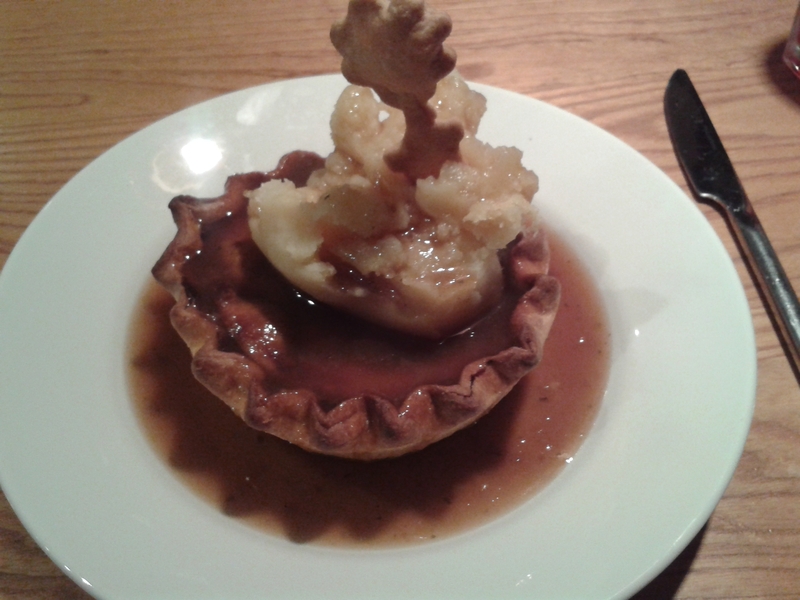 This entry was posted in Travel and tagged Pie and Ale Manchester vegan, vegan Manchester, vegan travel. Bookmark the permalink. I know what you mean about all vegan places – I’m still surprised how few there are in London, which has quite a number of vegans knocking around. I would have gone for the mushroom pie too out of the three – mainly because of the dainty little pastry mushroom sticking out there! I love the little pastry shapes on top!